The generation born between 1950 and 1970 has often been called The Baby Boomer Generation. There have been some variations on that title including The Me Generation, The Vietnam Generation and even for the sake of a certain comedian, The Al Frankin Generation. 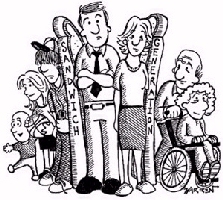 But the title that is most appropriate to where we are now, as we become caregivers for our children as well as our aging parents is “The Sandwich Generation”. This is a painfully appropriate term because those of us in our late 40s to early 60s find ourselves with responsibilities to the two generations before and after us, both of which can be quite needy. The result is a fair amount of stress on us as moms and dads with all the demands that rising children, teenagers or maybe the children of our children can put on adults in this new century. The Sandwich Generation from an emotional stress point of view. The stress we realize when our parents begin to age is a new thing for us. Making ourselves aware of the needs of newborn babies is not hard to get our arms around at all. When everybody in the generation is having babies, there is plenty of support and help for those who are learning the quirks of what babies need. In addition to the great support and “parents training” classes and books, the arrival of a new baby in the house is a source of joy. There is great hope at the arrival of a new child and taking care of our children carries with it that creative element of doing something for the future. We see in our children our legacy so seeing them succeed and helping them overcome difficulty is exciting as we do all we can to “launch” the next generation of our family. But caring for aging parents carries less support and far less optimism. While there is some joy in knowing that helping your parents live a happy and productive senior life keeps grandma and grandpa around for the children, the senior years are ones that will have only one outcome. And as much as we do what we can to make things easy and give our aging parents the comforts and joys of the golden years, all the sugar coating in the world won't cover up the fact that at some point the end will come and we, the Sandwich Generation will have to be there every step of the way to guide them through the end in the same way we guided our new children through babyhood. The similarities between old age and infancy have been well documented. But it’s very hard on caregivers to go from being the ones these parents were always strong for who always took care of us to seeing that dynamic completely reverse. To see daddy who was always the smart one, the strong one and the one you could run to, get weak and old and lose his mental sharpness is hard to watch. Now is the time when he has to turn to you. It takes mature adults to be the sandwich generation. But we can take joy in knowing that, in a way, we are giving back to those strong parents who never spared any expense or time for us when we were growing up. Now when it's you they need, they deserve no less devotion and dedication to doing all we can for them that they gave to us when we were youngsters.